Nokia has released a special edition of their mobile music phone, the Nokia 3250. The new limited edition of Nokia 3250 WESC offers all the features of the original 3250 (support 1GB storage, dedicated music buttons, 2 megapixel camera), but has been given a makeover by fashion company WESC (We Are the Superlative Conspiracy). Principally, this means a new world design painted on the back of the phone, but WESC have also pre-loaded the Nokia 3250 with a digital version of the WESC Travel Guide. Nokia's partnership with WESC will continue with other products in the future, and so they seem to be following the same path as Motorola, who are always keen to partner with other firms they see as being hip (Oakley,Apple, Burton, etc.). Only 500 of the new Nokia 3250 WESC phones will be sold, this is mean it's a limited edition of Nokia 3250 mobile phone, though, Nokia are aiming for the exclusivity factor to give the new phone some added cool and stylish design. 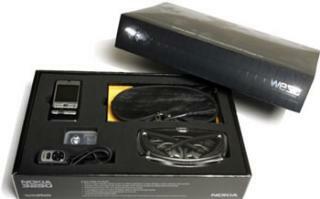 The Nokia 3250 WESC mobile handset has been packed in a Nokia WESC Limited Edition Travel Kit. 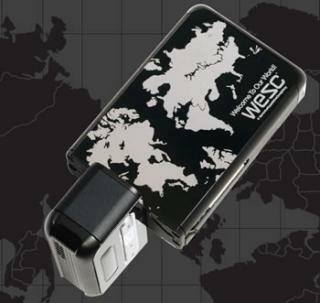 The package comes with a memory card and a digital version of the WESC Travel Guide. The package also contains other useful tools for the trip such as eye-mask, passport-case, printed travel guide from WESC, headphones from Sennheiser as well as a spare skateboard wheel from Stereo Skateboards. By turning the Nokia 3250 keyboard 180 degrees, the user can easily switch between the music controls and the telephone buttons. The music player in the Nokia 3250 supports most digital music formats such as MP3, WMA, M4A and AAC, which vouches for trouble-free downloading and transferring of music. Songs can also be downloaded over-the-air, anywhere, whenever and be used as ring tones. Nokia 3250 supports microSD up to 1 GB with a storage capacity of 750 songs. The Nokia Audio Manager-software lets the user to convert personal CDs to digital music files and easily transfer complete collections and playlists directly from the computer. Headphones can be connected to Nokia 3250 with a 3.5 mm-plug that comes in the box. Nokia 3250 is especially designed for music and is therefore the first mobile handset on the market to be branded with XpressMusic. Other features of Nokia 3250 is has a 2 megapixel camera that is activated when the phones keyboard is turned 90 degrees. With some simple pushes of the buttons, pictures can be sent by MMS or be printed out on a compatible printer over wireless Bluetooth-technology (for full specification of Nokia 3250 is here). The price of Nokia 3250 WESC Limited Edition is estimated to 400 Euros and will be available in selected stores in Stockholm, Gothenburg, Malmoe, Copenhagen, Oslo, New York, London and Tokyo starting 31st March.